During the height of my knitting-induced repetitive stress injury in my left wrist, when I was still working in the yarn shop, I met someone who hadn’t knit for 3 years, because she typed for her job and needed to save her wrists. I processed her words in horror and denial. No way could I give up knitting for such a long time. Unfortunately, though, I’m on a knitting hiatus again, and I think I am going to have to make it longer. In the fall, my knitting-induced repetitive stress injury in my left wrist seemed to have finally gone away. It still sometimes felt stiff, but I could knit without sharp pain returning. Unfortunately, that did not last forever. Since Christmas, the wrist pain has been coming and going, and I’ve finally given in to the fact that I might need to take a much longer break from knitting than I initially hoped. Now that I’m not working in a yarn shop, and that I’ve gotten used to filling the knitting hole with other things, the break from knitting sounds less depressing. I’ve always loved coloring intricate patterns, even before it became so popular recently. Photocopies of mandalas and other coloring pages for after school classes I taught was always one of my favorite time fillers. And I’ve always loved coloring with markers more than anything else. I have a childhood memory of a camping trip we took once. I had a brand new coloring book and set of skinny Crayola markers. I left them out on a stump overnight and it rained on them. Ever since, when it rains, I often worry that I’ve left something precious outside that will get ruined. 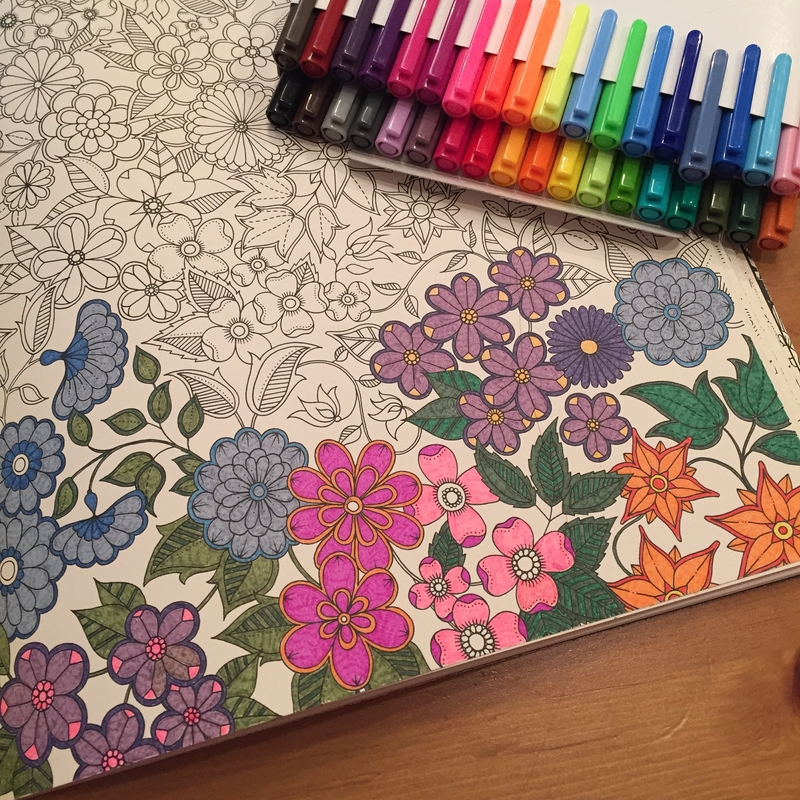 It’s no surprise to me that I love, love, love Johanna Basford’s coloring books. I’ve only got Secret Garden right now, but I want all of them! I don’t even have any interest in other coloring books yet, because I know hers will take me a long way. And I splurged on the 30 color set of Staedtler fine-tipped pens. The tips are perfectly fine and smooth for all of the intricate little details in these books. But what am I making? Even though coloring has filled a bit of the meditative, creative, color gap that knitting has left behind, I’m still missing a crucial element. I want to make things. With knitting, having the finished product was part of the appeal. Having crafted something with fine materials, having felt that piece grow between your needles and take shape into a useful, beautiful garment, was part of my satisfaction. The texture of the wool, the spring and stretch of the stitches as they slid across my bamboo needles, the squish of hand knit socks under my feet, all of these things are important to me. That the finished item be useful, well-loved, and even worn out was the ultimate pleasure. Since even gripping things in my left hand bothers the painful spot, I’m hopeful about embroidery because I found these hoops. I’ll probably start with a plain one right away, since I already have one, but if holding the hoop bothers my thumb, then I know there’s this option. I do have an appointment next week for an evaluation with a physical therapist. My doctor diagnosed me with De Quervain’s Tenosynovitis. I’m hopeful that I’m on the road to something that will work for me. Take care of your hands, crafters!